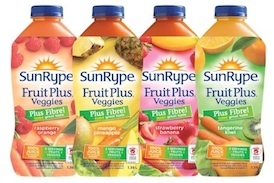 SunRype Fruit Plus Veggies Plus Fibre – NOW WITH FIBRE! Life gets busy and sometimes it’s hard to eat right. SunRype Fruit Plus Veggies Plus Fibre juices can help you get more of what you might be missing.